LOCATION This attractive detached family home is located within walking distance of a number of local shops including Tesco Express. Conveniently, Horsham town centre is approximately 1 miles distant and Horsham station, providing fast access to London Victoria and Brighton (via Three Bridges) is approx 1.1 miles away. The property is located close to both Heron Way Primary School and The Forest and Millais secondary schools, which both boast excellent reputations. Due to the ideal location, this property really could be your perfect family home. THE PROPERTY An extended detached family home providing generous accommodation throughout which comprises; Entrance hallway, cloakroom, front aspect sitting room with doors onto the dining room which is currently used as a snug and on to the conservatory over looking the attractive rear garden. There is a family sized kitchen/dining room/breakfast room with features a range of appliances and door leading into the garage. 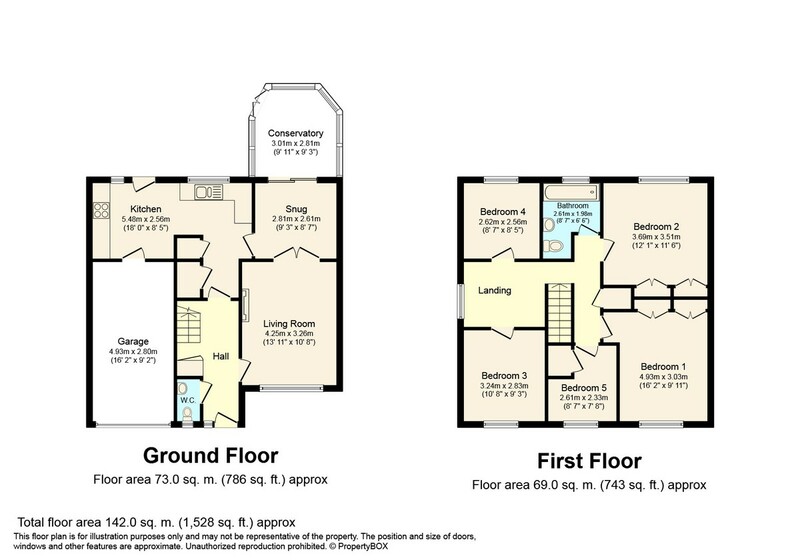 To the upstairs there are five bedrooms, two of the doubles with fitted wardrobes,study room and further single room. Completing the property is the large family bathroom with overhead shower. Further benefits to the property include double glazed windows and gas fired central heating to radiators. The property is offered on an unfurnished basis and available for occupation late April 2019. OUTSIDE The generous rear garden is a particular feature of the property. There is a patio area with a garden shed and summer house along with a lean to the side of the house offering further storage The garden also backs on to Heron Way Primary School and is secluded from neighbours. The front of the property offers parking for two vehicles and garage access.